Keep all the info about each one of your guns together. Heavy paper folder has space for: usual data, plus, info on scope, sling, and alterations. Each folder comes with its own polypropylene page protector. SPECS: 25, 8-¼" x 11" sheet with 25 individual polypropylene page protectors. Hold all informasjon om hver enkelt av våpen sammen. Tykt papir mappen har plass til: vanlige data, pluss informasjon om omfanget og slynge endringer. Hver mappe har sin egen polypropylen siden protector. Spesifikasjoner: 25, 8-¼ "x 11" ark med 25 polypropylen enkeltside beskyttere. 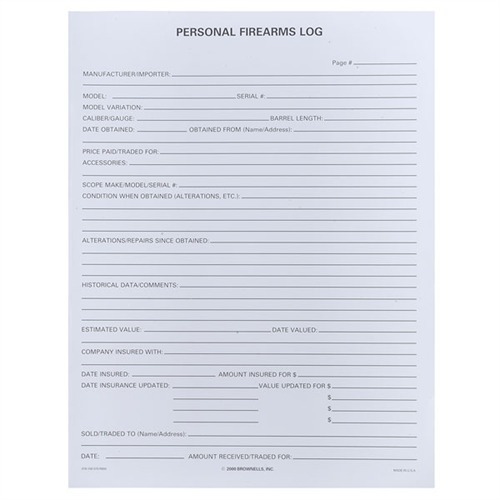 These pages address all the pertinent information you should have for your firearms -- cost, values, condition, accessories, maintenance history ... the works. Perfect for insurance and estate purposes, plus being an invaluable aid to what you "remembered" about your guns, or what your survivors need to know about your guns! Excellent product. Much easier to use then trying to make something myself. Glad I found these. Personal Firearms Log 050806104068 Hold all informasjon om hver enkelt av våpen sammen. Tykt papir mappen har plass til: vanlige data, pluss informasjon om omfanget og slynge endringer. Hver mappe har sin egen polypropylen siden protector.